Is this birch or cherry? I just got back from the hardwood dealer this morning and rough milled the boards before letting them acclimate to my shop. They were all marked as yellow birch, which I purchased to use for a paint grade bathroom vanity. However, when milling them, a few had that very distinct cherry aroma. They look an awful lot like cherry (both sapwood and heartwood). If I use these, will this present a problem with bleeding into the white paint? I plan to prime them with BIN, so I don’t imagine there will be an issue. Looks like cherry to me too. It’ll be fine to prime and paint. Looks like cherry to me. I say save for another project. Buy some beech or poplar to paint! I wasn’t going to say anything, but since Bob did… He’s right. Painting cherry is a waste when cheaper wood will look just as good. I wasn t going to say anything, but since Bob did… He s right. Painting cherry is a waste when cheaper wood will look just as good. Well this kinda was cheaper wood lol. It was sold as birch for $3/BF. 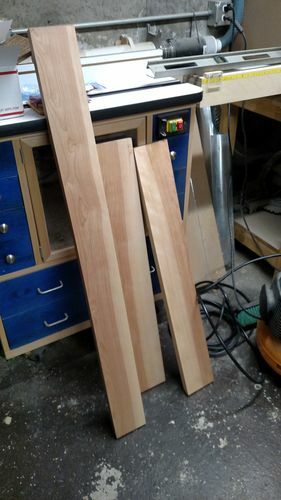 Sapwood or no … $3/BF or no … if you paint cherry you do know you will go to woodworker hell, right? LOL! Let’s say you bought some packages of chuck steak at the store for a pot of chili. After you get home, you realize two of the packages actually contain USDA Prime dry aged New York Strip. Would you cut that up and put it in the chili, or set it aside for something special? Birch also has a clear distinction between heartwood and sapwood. Hard to make a call from that pic. Does it show the small black mineral streaks that cherry usually exhibits?